I'm fudging things a bit here since I've never read the whole book -- it's too painful. Some background: When I was in second grade, our teachers showed a filmed called "J.T." 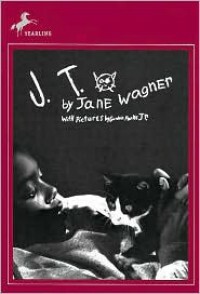 It's about a black kid growing up in an inner-city ghetto who befriends a stray cat. As this was not a comedy, you can guess what ensues. The images and the storyline so affected me that 30 years later I'm still afraid to read the final chapters of the book, and I certainly don't want to see the movie again. A friend & co-worker turned out to be the only other person I've met who's seen the movie (outside of my 2nd-grade classmates) and she gifted me the book for Christmas one year.